Search For "Restaurants & Bars" Companies in Welch, Oklahoma - Click Here Now! Our Mission Is To Help People Prepare For The Inevitable Hard Times Ahead With The Best Long-term Storable Gourmet Foods On The Planet. We Are So Convinced That You Will Love The Quality Of Our Food We Allow You To Try The Foods For Free. Visit Our Web Site, Take The Short Video Tour And Order Your Free Meals Today. 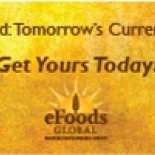 EFoods Global Independent Business Owner in Welch is a company that specializes in Eating Places. Our records show it was established in Oklahoma.